Day 2: A lot of our free time in the last 24 hours has been spent talking amongst ourselves about what we can do here as teachers: given the resources available, the national exam, the cultural expectations...what can we provide as suggestions/ideas that will be sensitive and useful? It seems that the biggest interest among teachers--and expressed by the headmaster-- is learning different teaching methodologies. We're supposed to give a Teacher Development Seminar on Saturday morning, so we spent an hour talking with the head teacher this morning, another hour and a half observing classes and talking to teachers, and we've written a short questionnaire for teachers so that we have a sense of what their greatest pride and challenges are- then we'll have 24 hours to design our seminar..."an interesting post-colonial challenge," as David put it. Some observations from my time in mostly primary-level classes later. This afternoon, after a lunch of grilled-cheese sandwiches (I skipped the salad, though it looked delicious and everyone else ate it- the diet here is very carb-heavy), our guest coordinator took us on a hike. We walked out past the tennis courts, through the village of Kitongo (thatched-roof huts made of mud, people and animals sharing courtyards, fields of corn, tomatoes, and cassava), and then on towards a really amazing outcropping of rock. One of the Masai guards was accompanying us and Sheryl and Ben, our former Peace Corps Volunteers, practiced their Swahili with him - a tall young man with stretched-out holes in his earlobes and a nice, shy smile. I have some wonderful photos of him, and we were glad of his company and intimidating presence when we came to the shore of Lake Victoria and passed by a couple of groups of fishermen. It was a wonderful hike, with these crazy rock formations up on little mounds, and a dramatic wind that blew across the land - it was probably 85, and the sun was really intense, but the wind helped keep us fairly comfortable. When we got back, we went down to the bar by the lake and sat there for an hour: another really dramatic storm blew up while we sat there, and we just made it inside before the rain pelted down. We had another dinner with the girls - big plates of potatoes with a little tough meat and stew - and I brought another book to read to several different groups of kids, and the girls sang again and led their own prayer service afterwards. I've had very limited internet access - I write on my iPad's "Notes" app and then upload quickly when the generator is on and we happen to be in the main house where the router is - and I miss Joe and the boys! I had a terrible night of sleep last night and am hoping to do better tonight with some earplugs, a different pillow, and having had some exercise. Pappa You have a wonderful way with words, Giulietta. Have you given any thought to a future writing career? 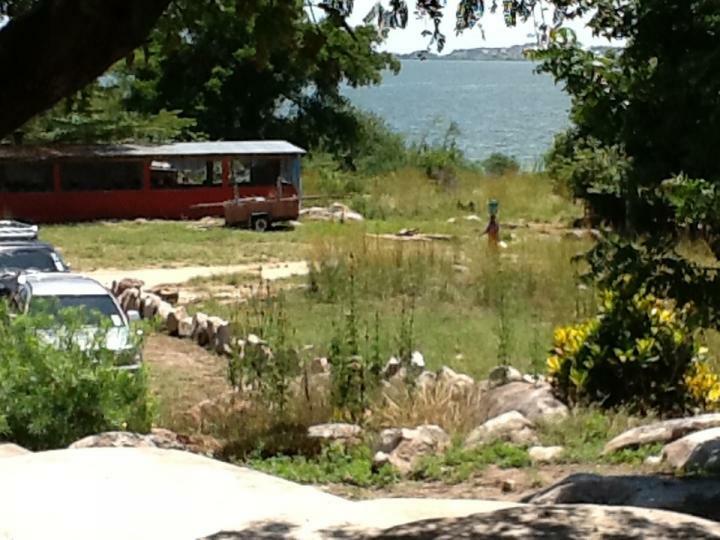 Lake Victoria, what a dream! Wonderful. Stay well. Tanti baci. Ellie Disturbed sleep...it's called jetlag...flying east through many time zones...bet you have periods of drowsiness during the day! Sounds like a great experience, as well as a good challenge, to interact and to offer helpful suggestions. Surprised you can upload such good material!